An art installation with more than 168,000 used straws highlights the environmental apocalypse wrought by plastic. "Parting of the Plastic Sea," held this week in Ho Chi Minh City's District 2, is an initiative of Benjamin Von Wong, a Canadian artist. 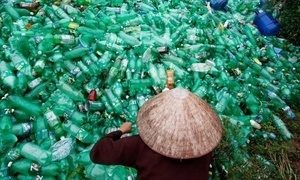 His first social impact project in Vietnam is organized by Zero Waste Saigon. 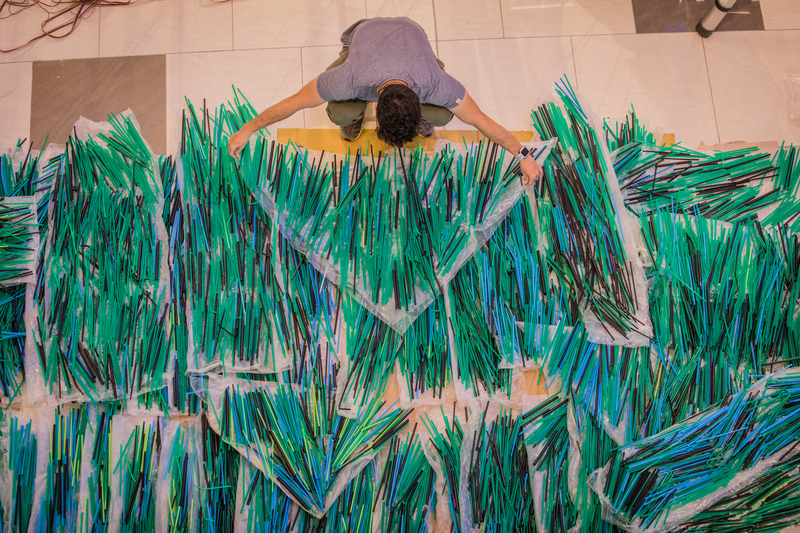 Blue, green, and black straws are used for sea waves and the foam is made with white straws. Zero Waste Saigon (ZWS) was set up after "we saw baby monkeys eating plastic bags, which made us really sad. We decided to do something," Julia Burdge, from France, told VnExpress International. 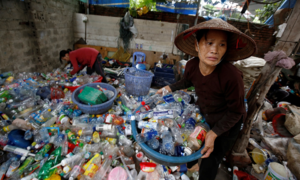 She and her American husband, Michael Burdge, came across the plastic tragedy when they were hiking in the forest in Ho Tram town, 2.5 hours east of Saigon. The sight led the couple to found ZWS, which aims at reducing plastic waste and introducing eco-friendly solutions in Vietnam. The ZWS page has more than 10,000 followers. 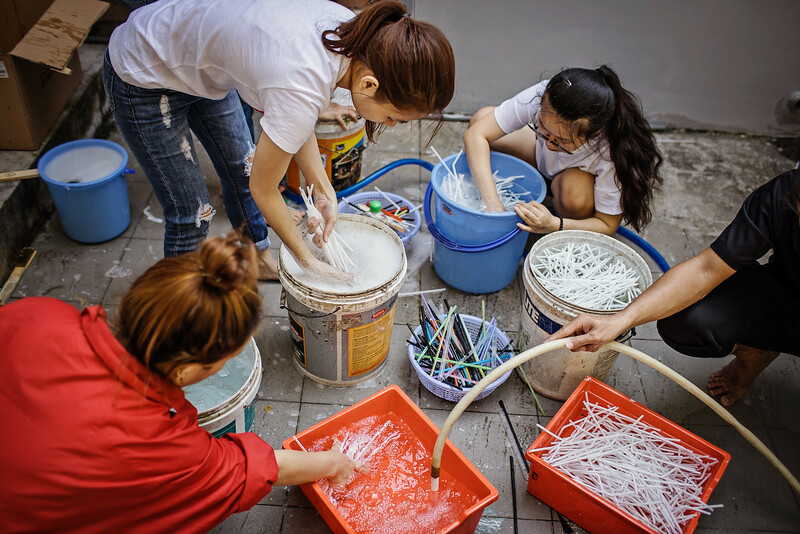 In order to collect enough used straws for the art work, ZWS organized big clean-up events in Hanoi, Saigon, Nha Trang, and Vung Tau at the end of last year. The clean-up attracted hundreds of volunteers, mostly 15 to 24 years old, who used sticks, pickers and bare hands, not only to collect straws, but also clear many different kinds of trash from streets, manholes, and rivers. The straws were collected over a period of two months. Straw donors also included café and restaurant owners, and individuals who bought straws but never used them. Benjamin Von Wong, who has acquired a name for himself for adventure travel and hyper-realistic photography, has been applying his creativity to implement conservation and social impact projects for about three years now. "It was my girlfriend who inspired me to be more mindful about the environment," he said. Australian Anna Tenne, who travels everywhere with a cloth bag full of reusable tupperware, utensils, water bottle and so on, has been committed to a no plastic lifestyle for a long time. The couple have been dating for four years and Anna, a professional photographer, is the main lenswoman behind this project and many others of Benjamin. "Most of his projects in general don’t take place in the West. Ben is absolutely amazed by the support he's got in Vietnam," Anna told VnExpress International. ZWS' Julia is a big fan of Benjamin's work. 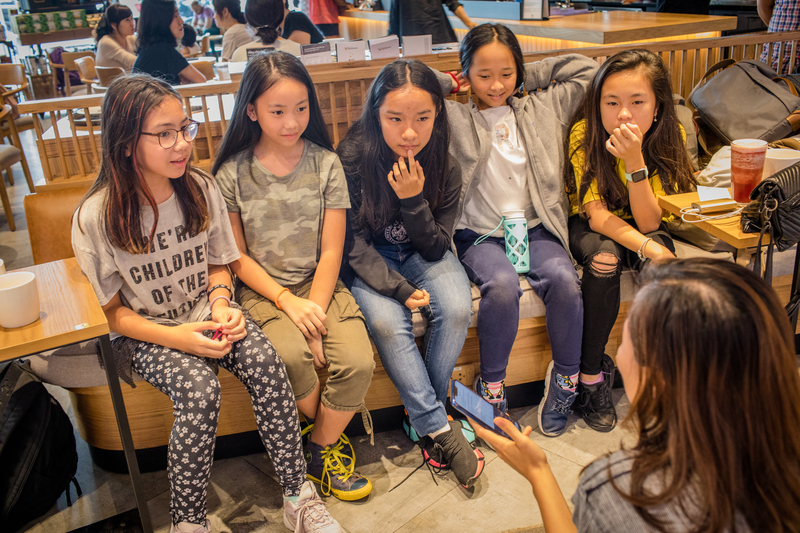 She reached out to him last June to invite him to Vietnam to do an impact project to raise awareness about plastic use. 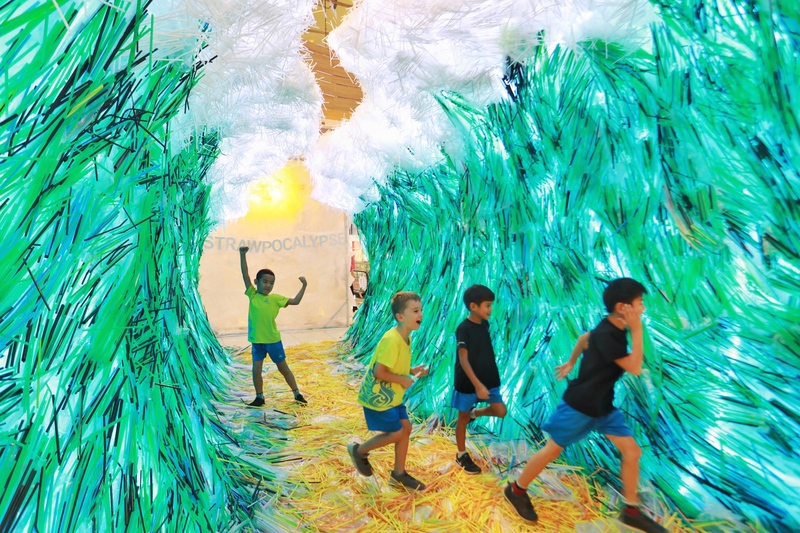 "This is what the future is going to look like," Benjamin said, pointing to the huge pile of plastic straws that would be assembled to resemble sea waves. "We only need a plastic straw for like 10 minutes, but it would take about 400 years for it to decompose," he said as he instructed volunteers and glued straws to plastic bags himself. More than 100 volunteers showed up at a palace in District 2 to help erect the sea waves on Friday. 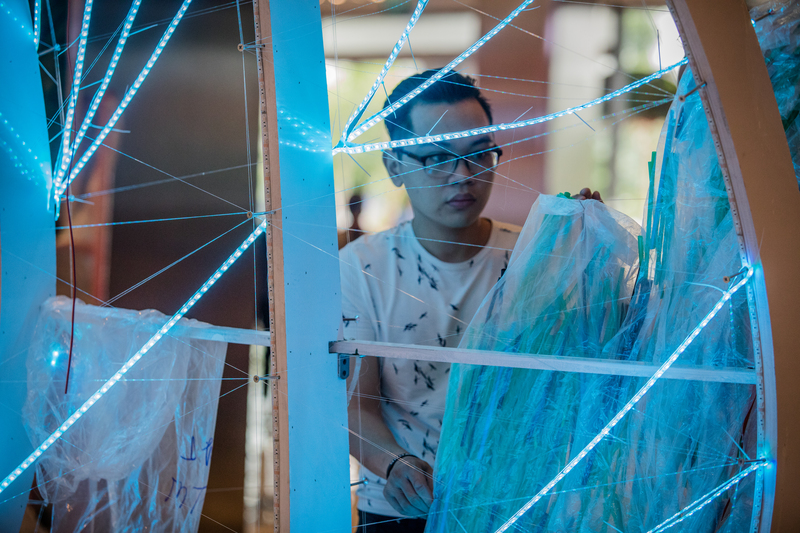 Benjamin instructed them to lay LED lights along the skeleton frame over which he and others could later attach the straws already glued to plastic bags creating the waves that would shine glow. Some volunteers were Benjamin’s fans, many were followers of ZWS, and the rest responded to its shout-out for volunteers. While straws might not be the biggest problem, they are ubiquitous and a daily use plastic item that people can easily relate to, Benjamin said. By 2050, it is predicted that there would be more plastic than fish by weight at sea, according to a 2016 report released by the World Economic Forum and the Ellen MacArthur Foundation. Another 2016 study by these two entities and McKinsey Company shows that every minute, one garbage truck of plastic is dumped into our oceans. Since January 2018, ZWS has successfully convinced over 100 businesses to use sustainable alternatives to straws. Among them is Tran Danh, owner of Quan Bui, a chain of Vietnamese restaurants founded in 2009. Danh began to stop using plastic straws at his restaurants three years ago. Currently all Quan Bui branches use grass straws produced by ZWS and receive great feedback from restaurant goers. But behind it was an array of trials and errors. "We started off making our own citronella straws, but it was too time-consuming. We later switched to paper straws, but they soak in water. We even made straws out of morning glory, but it requires very strict sanitary techniques otherwise it's not safe for users. We began buying metal straws, but many customers like to bite straws and we received so many complaints from those with sensitive teeth. "I eventually found Zero Waste Saigon who offers grass straws certified by Ho Chi Minh City Pasteur Institute, under the Ministry of Health. It's been a hit!" Danh said. 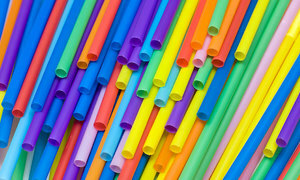 The cost of these straws are 20 times that of plastic ones, which is a serious concern for any business owner, but Danh thinks it's worth the investment in the long run. The Friday event drew many children. Some young kids were brought by their parents who hoped to plant early environment awareness. Others came as volunteers themselves. There were a group of avid environmentalists aged 11 who have their own plastic project at school. American International School Vietnam, which sent them to the event. They run a club called 'Earth Day Community' and organize a competition called 'Zero Plastic Lunch' once a week at school. "Nobody has won so far, only us," one of them told VnExpress International, giggling. The girls not only felt they were making a good impact at school, their parents also supported their efforts at home. 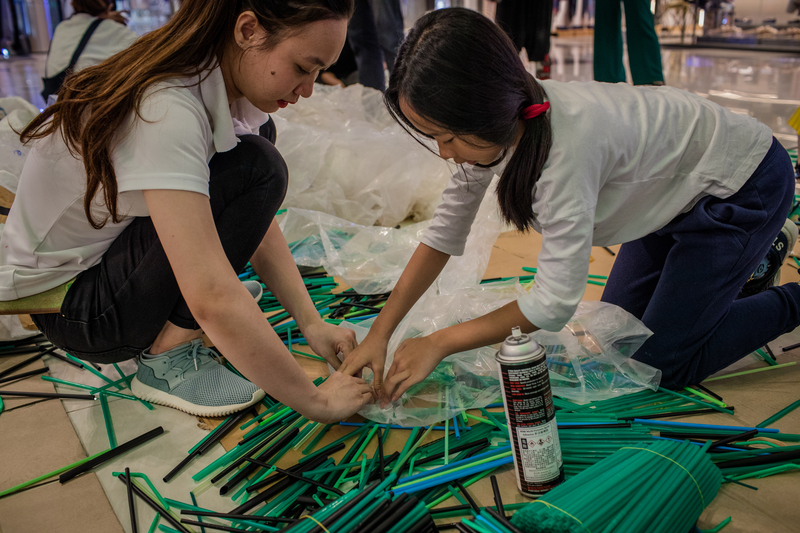 Prior to the installation days, they had been working with Zero Waste Saigon, which co-sponsors the project with Starbucks Vietnam, to help with sorting and counting straws. 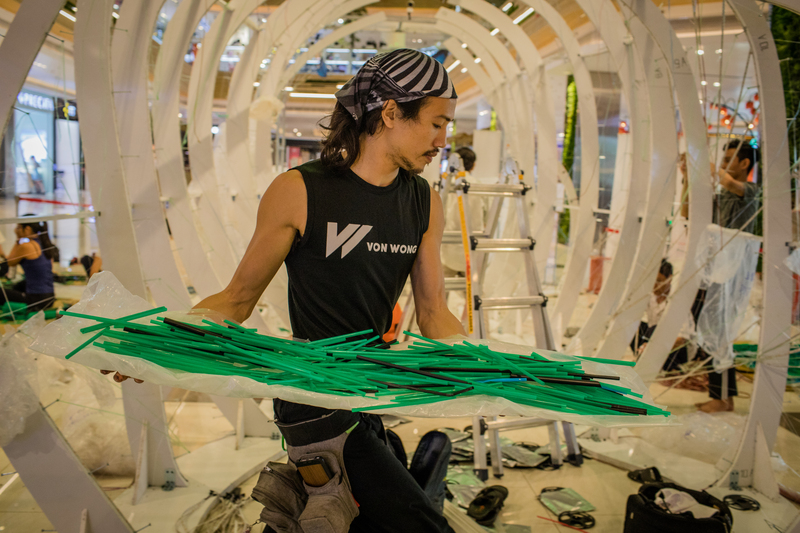 ZWS and Benjamin Von Wong believe the consequences of massive amounts of plastic used and dumped into landfills and oceans will be faced and felt by future generations. "I have a son and I really want a better future for him," Julia said. 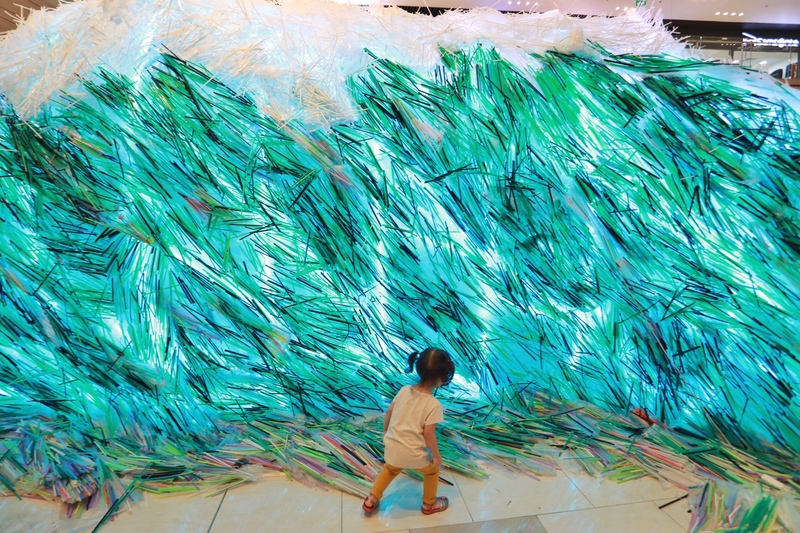 "Parting of the Plastic Sea," which took two weeks to complete, was officially launched Friday and will be exhibited for two months at Estella Place, which has offered ZWS the space for free. Benjamin said: "We hope some other organizations would like to adopt our art work so it can travel elsewhere in Vietnam. I’ve also already received suggestions from colleagues and friends telling me to take this to other countries. Instead of lying around in the street where we found most of them, these plastic straws are here today, hoping to start a dialogue with people."